This year has been an experiment. I never did a blog before and while I know that many seek to make money through their blog, that was not my driving motive. I tried to bring to faithful readers and periodic visitors a variety of subject matter centered as much as possible upon the spirit world, God within, and closely related topics. At the same time, I held ongoing teleconference events every other week from August through December which also covered this same array of topics. Those who partook of both this blog and those events would have gotten the most out of both offerings. In a world so distracting of the human mind and heart, it is no easy task to write things that will hold the continued interest of more than a few people; and staying on task thematically is another great challenge. Did I succeed? I cannot answer that question. Only you can answer that question. Your feedback in your comments told me much about if or how much you found meaning in what I wrote. As for sheer numbers, they were not great; but then again, for everyone who does post something, there are probably a dozen who don’t but are, nevertheless, faithful readers who do find value in what was posted but are just not inclined to respond. Statistically this is probably in keeping with other periodicals; a greater number who read versus those who read and respond. We have a built-in means to track which blog posts get read, when and how often they get read, and who responds by writing comments to posts. The numbers show a significant number of readers, though nothing overwhelming. As a beginning, where competition for peoples’ time and energy is at an all-time high, the results were more than favorable, thank you. I am not at all disappointed, but rather pleased and very happy to have taken a year out of my life to do a blog and to have any and all present in any capacity. Again, in the end, I am not unhappy with the endeavor; your responses—many so sincere and genuinely heartfelt—spurred me on as a new week approached asking for another post. I am a spiritual medium and consequently, in my heart of hearts, I am about what happens to a human being once they leave their physical body for the last time. I see, hear, and know too much about the afterlife or the spirit world to not be involved and concerned and with a desire to lend information that may prepare an individual to the maximum when it comes time for his or her departure from planet Earth. While religion permeates earthly life and may give some meaningful specifics about the afterlife, it is not an exacting science. It may tell you that you are going to die and that you will go to a place of a wide variety of habitations; anywhere from being one with God to being the furthest away from God; Heaven and Hell. Religion may tell you what spiritual principles to observe and live in order to guarantee a safe and sublime arrival on the other side. What religion does not give is the science of your spiritual self in relation to your body, the mechanics of their co-existence, and the reality of how the spirit grows from physical body energy and the spirit made vital and growing from energies coming from the physical body. In the end, our understanding of death and dying is best served not so much by beliefs or simple faith, but by the science of dying and emerging into the spirit world. Your beginning on Mother Earth is made known by the word “born” and when the energy of your physical body has run out and can no longer serve your spirit, your ending on this planet will be known by the word “died.” These are the two little words, born, and died, describing your beginning and ending of your journey on earth; very final, absolute, and vital. They are the two great truths of every soul who ever took a body on the earth. There is much to do about being born but very little, by comparison, about dying. Most of this is because we welcome birth and eschew death! I will not go into the already well understood reality in our culture and the culture of many people around the globe as regards approaching birth and death. However, because death of the physical body is final, an understanding of the whole process needs more than a cursory glance: The degree of your understanding will bear greatly upon your departure. The greater the understanding about the process, from gradually separating as a spirit from your body to moving out of the body into the world of spirit, the easier will this process be. To have mere faith that God will take care of you “that hour” may be helpful, but to combine faith with factual knowledge, which I call a science, will make a great difference in your leave taking when it comes your time to kiss Mother Earth goodbye for the last time. I will not belabor the point as most of you are already well informed. You may, however, have relatives, friends, acquaintances that don’t have your leading-edge-awareness, and could use your input on the topic. They will be eternally grateful if your sharing has made more than a marginal difference in their passing and arriving in the spirit world, and will joyfully greet you to say thank you on the other side. The fear of death is greater than the process warrants, for in reality you are already in the spirit world! Right this moment and from the moment of your birth, you were already a spiritual being having your origins there, as well as your ongoing, eternal connections whether you knew it or not! Your earthly vehicle for your spirit may stop—will stop—and that means the stopping of your breathing and your heartbeat. The transition into the spirit world is instantaneous. There is no ending of life—never—there is only the moving out of the physical body, which you already do most nights of the week, and permanently into the spirit world. Herein lies perhaps the most troubling part, or one’s dilemma: What you do or don’t know about the afterlife will begin to show forth because in spirit you can only experience what you understand; and what you don’t understand you can’t perceive. This moment there are thousands of people who are leaving their body for the final time. In the midst of this sentence they have drifted away from their earthly body and are very much and totally so in the spirit world. They now face their ignorance and/or their enlightenment, and it is reflected in all that they see or don’t see all around them. Even the distance of sight is a reflection of the depth of understanding or knowledge. Those who know little cannot see very far into the spirit world–if at all–in cases where there is total ignorance. They peer into the darkness of their own ignorance. On the other hand, enlightened ones—those knowing a reasonable amount about the other side—are standing in the light of their own awareness which includes loved ones, spirit guides not of family, and angels. This is a science; it is not the result of some random happening or accident. The simple adage that applies clearly and obviously is what you sow is what you reap. While we head into a new year, 2014 to be exact, I am not thinking about one year–but the many years ahead called eternity, and it is why I have dedicated my energies to contributing whatever I can to aid others where they need it when it comes to the spirit world and God within. May 2014 contribute significantly to our awakening in this area and all the remaining years afterward, that we can arrive in the spirit world one day with the best advantages as manifested in our soul that will take us to a place filled with divine love and light. Love and multiple blessings for 2014! Many thanks for your year of devotion. So you couldn't answer all questions. You are busy.Especially the stranger ones maybe like mine. Suicide really was a question. Not that I have any intentions…..but want to know about others in spirit world now who did. Also my questions of what the other side really looked like. It just can not be anything that anybody wants. Not again just nebulous talk of God’s love emanating from higher beings. I have written you a personal email seeking to cover what you are asking for. I felt a more personal response was needed as happens with some others who write me on this blog. OMG, Philip thank you for this eye opener. Is there more you can add to this in another blog.? Even though I did not comment often, I did find I was eager for it to show up in my email box. I want you to know that. Thank you. I don't know about others but usually what I should have said at the time comes to me 15 minutes or hours after the idea was said and then it is just not right to say it. One of those, why didn't I think of that then kind of thing. And I want to thank you for that Rainbow of a Christmas card. I loved it. I am very interested in how, even the distance of sight is a reflection of the depth of understanding or knowledge. Can you say more about that.? Philosophically and spiritually I do not work with an eye toward outcome, as that, from my experience, is not so much in my hands. Therefore, I write something like this blog and seek to do my part and leave the rest to Providence. If what one is doing is truly from Heaven, Heaven will intercede to bless a work and keep it going. If not, then the message is either to change how one is doing something, or to stop doing it altogether. This is how I have worked for many years and have been able to not be affected by the appearance of things; for behind all that is happening in any of our lives is a great Force working 24/7 to fulfill what needs to be fulfilled. I understand that you are not always ready or able to respond to a blog and may have some trepidation. I think it was invaluable for you to voice that on this blog, as it may be ultimately very liberating to share such a struggle–first, because you undergo it and secondly, because there are others who have the same confrontation in writing. I respect your sharing your thoughts and feelings on this matter. As for how understanding determines depth of sight in the spirit world: It is simple, actually. When you look at anyone, you can only know them to the degree that you understand them. Many people live side by side for years, but they don’t really see each other because they don’t take the time to look at–really look at–the other person; and so their understanding and therefore appreciation is very wanting. The depth of your understanding of a person tells us how deeply you can look into their whole being. Little understanding, little depth of inner view of a person. How this translates into the spirit world reality should be easy to decipher from what I have said, for the same principle applies there as understanding is not just an intellectual reality; it is the basis for comprehending all of life, including its Author. If I am prompted to continue with this latest blog in some way I will. Thank you for the request. It is greatly appreciated. Glad you like the Season’s Greetings card that Vivien and I sent. Your deep sharing here and on many other occasions, are more helpful than you may know for many of us. Certainly for myself. I have rarely sent responses, not because your sharings have not touched me. Quite the contrary. My lack of replying is more to do with my own sense of inadequacy as to how to share what I think and feel. Indicating my own "road block" within. Which too is good for me to recognize as a beginning to freeing myself from such illusionary thinking. Bless you always for all you have done and continue to do Philip. You are a Light worker and Way Shower helping to light the paths of many of us and I pray you will always continue to do so. Thank you Christine for you kind words. When I was on radio with a listenership of 70 to 80 thousand per week, I had not a clue as to what they were thinking or how they were responding to what I shared for an hour once a week. Yet, the fact that the number stayed the same over a wide span of time told me that they were returning each week because they found value in what was being shared by me. Thus, when I started this blog I was well equipped to not knowing the mind of those who read but did not respond except….our ability to track the numbers by way of our software program told us that the numbers of people involved–at least those who read the blog–remained generally the same. This fact was invaluable in knowing that what was shared was also appreciated. As for a Light worker and Way Shower, I happen to know that many who read this blog could fit into these categories and I am humbled by the fact that they take the time to drop by to read and/or post a comment, including you Christine! Thank you so much for your beatiful posts. I am one who reads often, replies rarely and always appreciates your writings. For me your love and sincerity are what always comes through and is a blessing to everyone who reads your posts. You have given a gift of your love to all of us. Blessings to you and your family during this Holiday season. Thank you much Cynthia. I am very aware of you, silent or not, because when you do care to share you always leave a plus in your wake, not to mention love. Thank you Philip for your heartfelt inspired messages of 2013. Each post rang true in my soul – and now after a year I'm finally writing a comment to thank you. I have cherished our relationship by way of your ongoing, faithful attendance to the setting up of and maintaining both my website and this blog. Also, over the years of this process of building a better website and a better blog we have had some deeply meaningful spiritual exchanges that have touched my heart greatly. You are a treasure as programmer/facilitator but moreover as a dear spiritual friend. I look forward to the day that I can sit down with your wife and children and spend some time together. Dear Philip Vivien and all the members of divine circle. I wish you all Merry Christmas and fantastic New year with unconditional love , joy and greatest wisdom in life. Philip I always enjoy your blog and hidden teachings behind it. I apologize not writing any comment. I am little shy person and having English second language not inclined to express my views. Hopefully one day I will be able to explore the mysteries of the Universe. This is one of my favorite subject. Somehow I know that when I was child I knew all the secrets but something happened and out of fear I have blocked all the psychic impressions and knowledge within me. Wish you all again a healthy perfect life with a loving heart. warm regards. Never hesitate to make a comment. Your English is fine. I am always happy to hear from you and you know I have a great love for India, as I have been there twice for extended periods of time and when you appear on the scene you bring all of India back to me. Thank you for that. Your over all and specific contribution in your posting is very much appreciated, including what your guru said. Philip, This is a wonderful post! One that I plan to forward to a number of friends and family. Whether we have an understanding of the spiritual world already or not, it is always of utmost importance to be reminded of, as you say, basic science and facts. We exist within an ongoing, organic dynamic on every level. It can be exhilarating. It can be confusing. As Ram Dass wisely noted, "We're all just walking each other home." Your blog is a part of that. It's a journey in progress and can only get better. As usual, you bring deep and beautiful thoughts to us. How much they are appreciated. I love your quote from Ram Dass, “We’re all just walking each other home.” It says it all. Thank you so much for gracing us with your heartfelt love and wisdom. Jaime and I are eternally grateful we met you back in 1989. May your work continue to expand and reach the many who need and want to know. It has been years since we saw each other in person but time does not seem to change our mutual, heartfelt love and appreciation for each other. Your words of encouragement to continue this work, to expand and reach many who need and want to know mean much more to me than you can know. They are both a pointer and comfort. Please know, that I so value and am edified by your sharing your gifts and your knowledge about spiritual matters, and I am certain that I am not alone in feeling this way. Even though I may not comment on every blog post, I read them all immediately because they are food for my soul. You articulate so well what I know in my heart to be true, and so everything you teach resonates with me to my core being. You are a master teacher, healer, and disseminator of truth, and I am so grateful that you do what you do. I pray that your heart for this service continues for a long time to come, and that you have robust health to accomplish all that you desire in this lifetime. In the past, I recall your voicing concern that others might revere you personally as the messenger. Be assured that though I value you as a fellow traveler on this road back home, I do not place you above me, or even beside me, but I do place you ahead of me on that road, and I am certain that there is much more I can learn from you. Please continue to share your messages on this blog, and I will do better at responding so that you realize the value of your blog–to me and to those on whom I have some influence, as well as others. "What you sow is what you reap" is basically the law of karma, and it is what I keep in mind all day every day. I am far from perfect, but with the help of your guidance, I pray that I will arrive in the spirit world greeted by all of the enlightened ones you mention. I am looking forward to your next post! Have a blessed New Year full of joy and good health. From the time we met on your television show until now there has been an ongoing exchange of spiritual energies and I cherish that more than you are aware. In a world so caught up in seeking fame and fortune we have lost awareness that the truth of things is more valuable than all the riches in the world and that love is the great good of life, not materiality or self aggrandizement. I treasure you and all those who are all walking side by side on this most golden path of seeking and finding the truth. I am in your debt for caring so specifically and so sincerely. Your letter brought tears to my eyes…. Your blog is wonderful: you have NO IDEA how inspiring you are!! Well, maybe some idea. But all joking aside,you are one of the most inspiring people, Philip, and I'm very grateful you are choosing to share your knowledge and experiences. What can I say except that you are a dear dear soul for adding to my awareness of the value that these writings bring and to the hope of future blessings through them. You know, I don’t know about your life, but mine is so chocked full of spiritual involvement that I really do not have the time to stop and look back, only forward. But, your comment enlightens me as to the value of having shared in this year and it brings me to a place of humility and hope. Thank you so very much for your kindness. You too have brought tears to my eyes. This year I have been opening my own ways, owning every step I took. I haven't participated in all your conferences, which I very much appreciated and learned from last year, but I did read all your posts and everyone's comments. I want to reiterate that, without a doubt, the teachings of Saint Germain and your mentorship through emails (and even phone calls!) have been invaluable to me. I've said it before, and I'll say it again: you have taught me how to live! You helped me understand that God lives within and that He's experiencing a unique part of Himself through me and my course. So, I've learned to integrate everything that comes my way with confidence that it's part of a Great Plan, and that it's permeated with the Love of God. It's such a simple lesson, and yet it makes a world of difference in how I face my life every day. And when I can't keep it up, I've learned to be patient with myself and give myself the space I need to learn from my mistakes. This has given me such perspective when dealing with people; I find myself having more compassion toward others. And since I learned these fundamental lessons I've seen changes not only in my life, but in the life of those I love most. Having a clearer understanding of how life works has made it so much easier to reach my children. I've learned that silence speaks more elloquently than any words, and that trusting God's working in the lives of those I love brings a kind of calm in my heart that can't compare with anything else. I consider myself your student, and Saint Germain's. I've been very serious in comprehending what I learned, and on that foundation I've been working and discovering on my own. I think you have greatly succeeded as teachers as far as I'm concerned. I wish you the best for 2014, and you can be sure that whatever you publish, whatever you post, I'll be reading it with an open, joyful heart –and not just once, but multiple times, and keep learning. Thank you, Philip, and thank you Saint Germain. All I can say is that it takes one to know one. Your posted writing has touched me deeply, as I am sure it will many. And it has brought tears of gratitude to the One who makes this whole life possible. It is easy to see how God is working in your life. Congratulations combined with my brotherly love and appreciation. Thank you so much for taking the time to write. I greatly appreciate your commentary regarding this blog. You do my efforts justice when you say you are an “avid” reader and…you brought tears to my eyes when you wrote, “Thank you for a brighter eternity.” Is one of the most meaningful things that anyone in this work has ever said to me. It will echo both in my heart and mind as I plan my next steps in doing outreach in 2014 and beyond. I so appreciate your sharing as I am sure others will as well. 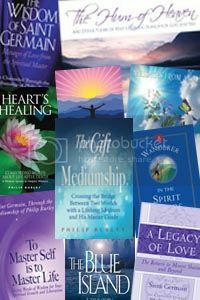 Thank you for sharing your time, wisdom and gift of mediumship with others and me it’s been very helpful for my progress. Your teleconferences as well as this blog have been priceless and I hope you will find an inner prompting to continue. I picked up my spiritual journal today and made an entry, it’s been a year since my last one. Your blog, emails and call have been a spiritual lifeline for me. My vehicle (body) has undergone surgeries to repair my knee, shoulder and more. During this painful process my body has been medicated for the relief of pain and this has taken my focus out the inner (spiritual world) and placed it in the outer (material world). But like everything else it’s a process that I needed to experience. You are the only person still in the body that I would entrust my spiritual side of life with. It’s been almost two years since you performed a spiritual reading on me. I must say all my questions where answered and everything I thought to be true was confirmed. I have heard the CD you made over 37 times and will continue to hear it because each time I get new insight. The service you provide is invaluable to because as you said in this blog you take to the spiritual world what you are in the material world. So, please continue sharing your time with us. There is a question that I have concerning this blog. You wrote in two different paragraphs, “ending of your journey on earth; very final, absolute” and “your time to kiss Mother Earth goodbye for the last time.” Are you inferring that this is the last body that all spiritual beings and souls will take up on Mother Earth? Or, are you only referring to this body at this time, meaning leaving this present body behind is final. But, always having the possibility of taking a new body on Mother Earth at some time in the future. Your personal sharing lends much to helping others with their attitude toward suffering. I watch many people from afar by way of correspondence and you are among those who is most earnest in getting all you can in spiritual understanding and growth while on earth. If you had not been this kind of person to begin with all of my words or prompting would not have had any or much influence. I say this to say that I am only a channel through whom spiritual information comes through but if it comes through to one not ready, it passes them by for a later day. Keep up your efforts toward realizing your full spiritual potential in this lifetime! I have enjoyed the blog, and found many topics very helpful. Thank you for all the time and effort put into it.I wish you, your family, and staff a very healthy and successful 2014. Thank you Michael. I am looking for a window of time to get back to your questions from some time back. I claim and affirm health and success for 2014 for everyone! Thank you for all you do to educate, guide, allow, embrace my journey through this life. I always love to read the posts, for me everyones questions are also mine, your answers are individualized however they always seem just right for me too. I appreciate the endless hours of your dedication to preparing for the cirlce calls and the blog, thank you eternally. Letters like yours help me understand that what I publish is meaningful and helpful. I especially admire you because you stay on task on your spiritual walk. Thank you for your example. Your words help me to feel excitement rather than fear and dread of passing from the physical life to the spiritual one. The more I learn of the spiritual life, the less fear I have. Thank you for revealing these truths. I love reading your blogs, especially the ones about St. Germain. Your words are a treasure to my heart for the ultimate purpose which I serve is to bring truths about the spirit world to earth to liberate us from ignorance and fear and to put us on the path of enlightenment and joy. What we are when we leave this earth plane is exactly what we will be in the afterlife. Therefore, it is absolutely necessary that we know the ultimate truths about life after death that we may learn and grow into the higher level of understanding and being before our arrival in the spirit world. Hello Philip, Vivien and Lynn and ALL those beings who have contributed to the words and heart you share with us through everything you do. I'm so touched by your heartistic and sincere response to each person. That takes so much time and focus, and your choice to respond in that way is truly walking your talk, in my mind. It also models what I know I want the Divine to be like … lovingly responsive to my efforts to communicate! When I see so many people so oriented to their smart phones, I-pads and other electronic devices, I wonder how they will ever feel the inner desire to make time and space to listen within. I know how difficult that is for me even though my sincerest desire IS to listen within, with the pull and distractions of this world. Your voice and encouragement to shift our attention is priceless, and I'm so grateful that you continue to give your gifts and perspective. Without your credible, interesting, well-written words (in your blogs and during the circles) it would be even more difficult to focus on that which is most important. PLEASE DON'T STOP! I feel your heart behind all you write. I just hope you do a turn around on your words that you may find that most, if not all aimed at complimenting me or our team efforts, you also have and just may not see or know it! You have written a periodical which I read a number of years ago when it came my way. Consequently, you know what it is like to serve people through writing and while it may take time, energy, and personal, loving care, it has its own attendant rewards. From the time I was a child, I felt concern for others and so writing in response to everyones’ posts on here is natural for me. I don’t mean this is some boastful, condesending way but it comes rather naturally. The major thing–and you, having raised children know this as well as I–we humans want and need to know that we are loved because we are our unique self! The catalyst and consistent energy-filled, motivating drive for my kind of outreach is always loving others as myself and then I know that I have my best chance at having loved correctly. In closing, each person is so precious and so needed in the universal scheme of things and I feel a great privilege to have my life interwoven with others as our lives become intertwined centered upon mutual respect and unconditional, universal love. Leave a reply on "Departure from Earth is Just the Beginning"